Warning: This post could have consequences. It’s happening. I can feel the buffeted hemming in of the raw passion of my youth. An encroachment of the dreaded ‘middle’ of life, an unwelcome guest to dinner. A gentle inhaling drag inward to begin to choose more sensible colors. An entropic enemy that calls for a settling into the middle. Not dissimilar to noticing that my own middle has mysterious spread out almost overnight. How did part of my tummy end up on my back? That’s weird. I didn’t see it there before. And then there’s that one stiff black hair that grows straight out from my chin with a vengeance, I have a matching one near my belly button, I call them my wild hairs. I thank them for reminding me about my truly wild nature. And then, yes I pluck them knowing they will be back, almost overnight. Even with a life that includes new love, art, travel, true vocation I must continue to choose, as I did in my youth to rage against mediocrity. To dare to dream the unreasonable dream. This was one of my early revelations – blame it on Hesse if you like, or the dead Kennedys or my blue hair pink combat boot days, that to survive I would have to be ridiculously unreasonable. I would have to LIVE from a space and place that was wholey my own. But where? Inside of course. But how to GET IN? I choose then as a rebel teen, and I choose now, to take up my stand against the settling in, settling down, being normal, and even concepts like ‘doing my best’. Can we talk about the tyranny of best a minute? I didn’t and don’t want to do my best nor shall I promise it to anyone. More than winning or besting, I wanted to discover and be me. This is a very different feeling quest than ‘best’. It is not easy for any of us as you know to discover our own true holy meaning of self which is often shrouded by other people’s ideas of greatness of which I want NO PART. I only want greatness that is specific to my own gifts. Yep. This life is not about giving my best, which is usually someone else’s interpretation of what a good job is. The work of becoming oneself at first doesn’t appear outwardly to others as ‘doing one’s best’. But ‘best’ isn’t performance based when you are an artist on the inside. Artist on the inside might mean that your external creations are haphazard or messy or not of service to anyone but your own soul. Becoming yourself is messy work (at best) and others looking in might wonder if you have gone mad. If you don’t appear to have lost yourself in order to find yourself you might need a new shovel. As these thoughts began to assault my mind, just a week after the flu is completing a circuit through my system I had a tiny breakthrough. The kind of which I might wait for – for many years, I will tell you that in a minute. First let me say, if we do not choose to fall in love with life, therefore, to be AWAKE to the awe and beauty then the temptation to go to sleep and give in to ‘comfort’ will be so very great. What are the ways one can keep themselves truly alert and engaged? I know addiction is a favorite among my friends and family, yes, the all powerful party. I am not knocking it. A Sunday wine tasting with friends can make the whole world seem livable. A view in the vineyard over red and white checked table cloths and salami and cheese and a book of Rumi is well worth it. And well one might not call that an awakening – it is at least participating in living. My breakthrough was about paintings, YES, again, don’t roll your winged eyes. (She is going to tell us everything comes back to painting – again? )Besides service work where you are giving to others, creating is one of the ways you can FEEL and stay connected to yourself. Much of the time we are numb, hardly feeling, grateful to cry, pissed off at the ‘system, but not pissed enough to cause a revolution. We are tired. I am no exception, and that is why I know, and why I fight it with fists and brushes. Here is my breakthrough: We can CHOOSE to walk the blade or our personal edge. So why is this a breakthrough, because usually trauma and life circumstance force us to the edge and then we have to walk it. BUT we can CHOOSE it consciously, if we are willing to be extremely uncomfortable in the process. This is what I have witnessed a hundreds times. When we paint we are brought to the very edge of misery and pleasure by own brush. There is an awakeness that happens right there at the canvas as we work to manifest a vision we truly want to see some to life, dare I say, we DESIRE it to come forth. And yet it usually, it won’t, not the way we want it to look anyway, and so we walk to that edge of being challenged to the point of tears, confronting ourselves, our demons, or skills, we WRESTLE with the canvas. Gripping both sides of the frame we beg for that dream to come forth and wriggle to life through particles of paint, thread and tears. That is why painting and in particular, Intentional Creativity, is such a powerful agent of transformation because it brings you to your personal edge. Like years of therapy coming to head at the tip of your own brush. It is wild to say the least. I can see that this is one of the reasons women are flocking to creativity across the world as a tool for transformation, but also a means of staying connected, and, yes, awake. If we don’t stay present, the chances of a mid-life melt down instead of a mid-life awakening are almost inevitable. I am not saying that painting will make it so that you don’t have to have one of those – however, I am saying that if you are creating the chances of you having some SAY in how your future unfolds is just WAY more possible. That is why we will spend Saturday together dreaming the year, yes, in paint. Even as a very creative and active being I have to choose this aliveness – to move away from the gradual deadening of mediocrity. I know painting and poetry and prayer have something to do with staying awake – and the paradox is that this kind of awakeness is also very nourishing for the “rest-parched soul”. The surest cure for deadness is to discover how to fall in love with everything. To let everything touch you. To be intimate with the universe. I am not saying this is easy. Talking to trees and getting something out of it is not as easy as it sounds. There has to be a fair degree of intensity, of desire, coupled with surrender if one is to listen to trees and fall in love with life even when they just tired of their job. In the most basic way – mediocrity can be fought of with creativity and colors choices that make your heart sing, cowgirl boots worn with pajamas and the setting up of an art studio. If all else fails, paint a room hot pink. Or bright blue like the wall of my new little studio in the garden. Our guest room was just painted HOT PINK – it is called the raspberry beret room. 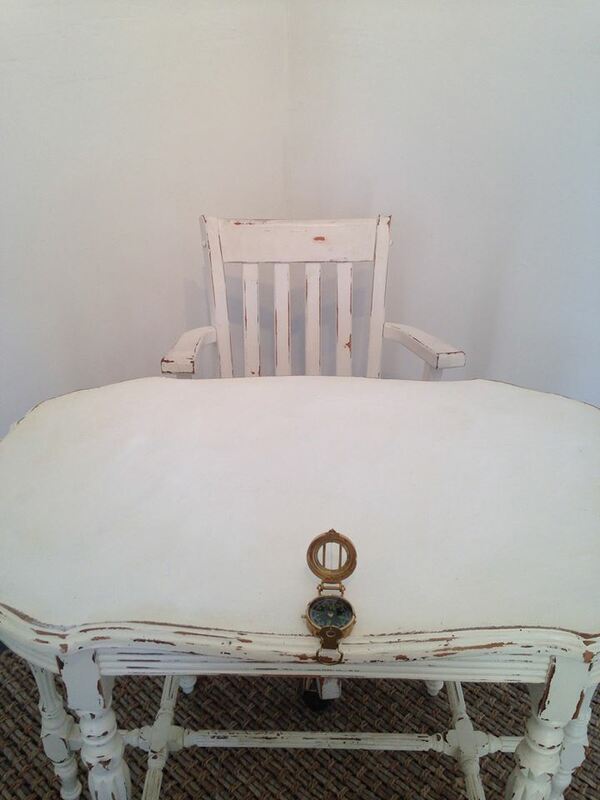 But for my writing desk, radical means pure WHITE. Today at the Red Thread Cafe there is a circle of woman gathered with me at Cosmic Cowgirls, and we are dreaming our futures together. I am REALLY truly BEHIND you in the cosmic way that is possible across the cosmos. I believe in us, and how RARE each person truly is, and the gift they have to offer. Sometimes that means raging against mediocrity – and for me, that is a spiritual practice. Today I took a RADICAL GLOBAL action. I will tell you about it on Saturday! So as part of my own RAGING against mediocrity and keeping the dream of revolutionary education alive, I TEACH what I know and invite you to that INTERIOR REALITY that Hesse and Rumi are point too. 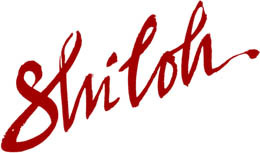 Most of the classes we offer around Shiloh Sophia Studios and the hot pink ship known as Cosmic Cowgirls are designed to banish mediocrity at SOME level. To WAKE us up to our own interior longings – and to bring image to that possibility stirring within us. $35 Sign UP to Watch Live or Watch Later! 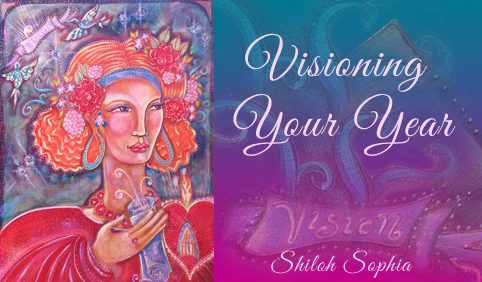 This Saturday I will lead you in VISIONING YOUR YEAR – for Unreasonable Dreamers Only. Then mid-February for those who TRULY want to increase their gifts of painting, come study with my very own teacher, Sue Hoya Sellars in Flora and the Milky Way. ← 22 Questions that long to be asked….